It's Tuesday morning when I first sit down to write this post, and the sunshine is blazing through the massive eastern windows of the waiting room in the children's hospital oncology clinic. Brilliant light glares through the ten-foot-high wall of glass with an intensity that seems overzealous for so early in the season. It flashes off of glossy magazine covers and sparkles cheerily through the saline fluid in Jonah's IV bollus. It warms the back of my shoulders to the point of discomfort and renders the feeble, electronic glow of my laptop screen almost useless. It's hard to believe that only one week earlier, I was snapping photos of snow falling on my flower garden. This sudden explosion of summery heat has set me—and my spring tulips—into a kind of squinty-eyed shock. Pale, winterized north Idaho inhabitants like me generally require a more gradual change of season. I'm used to waiting through drizzly May days for the occasional break in the clouds when a patch of promising sunlight will rest on the rug just long enough to lend it a hint of lingering warmth. I am used to keeping the winter coats ready on their hooks, just in case, until sometime in July. I am used to sending my kids to their first morning swimming lessons of the summer when the outdoor thermometer still reads 48°. But this? I am not used to this. This is true water park weather, and it's only the first week of May. Jonah is sprawled out horizontally across one of the small armless waiting room couches. It's safe to say that he is basking, soaking his skinny limbs in the warm tide of sunshine that washes over him. All he needs is a beach towel and a pair of trunks. And yet, here he is, several floors above the street, on a hill overlooking Spokane, waiting not for a for trip down the waterslide into the pool but for a trip down the hallway into a windowless procedure room lit by fluorescent tubes, for an early-morning spinal tap and a dose of toxic drugs. I glance up from my over-bright screen and make brief eye contact with another mom who is sipping hospital coffee from a white styrofoam cup. The sunlight sets curlicues of steam aglow between her face and mine. I very nearly say hello, but she quickly turns her puffy, sleep-starved eyes away toward the window. 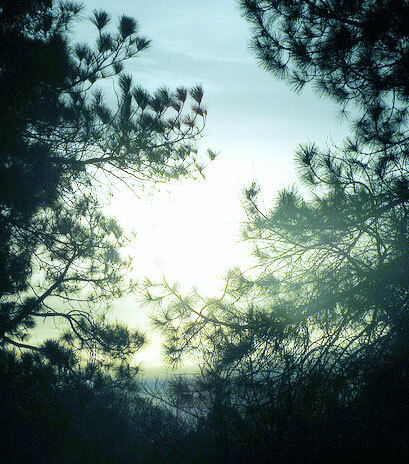 I follow her gaze to where the tops of the pine trees are lost in the brightness of the sunrise. Next to her, a dark-haired boy, about Jonah's age, is also waiting, slouched low in his chair. His eyes are closed, and his crossed arms rest across his belly. They are by far the hairiest arms I have ever seen on a child. 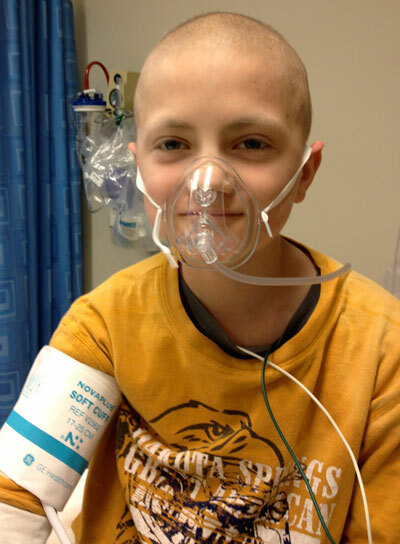 I try not to stare, wondering if this kid is getting the same chemo as my son. Jonah's own hair held out against the drugs for a long time—much longer than for most cancer patients—but now he hardly even has hair on his head, let alone on his extremities. Even his eyebrows and eyelashes have thinned. I turn my attention toward him. His feet are propped on a lime-green ottoman, and he is reading—or pretending to read—his paperback. "You want anything?" I ask. Then I remember. "Oh, nevermind. I forgot you can't have anything until after your LP." He looks at me from over the top of his book and slowly shakes his head. "Nope." He punctuates the word with a soft pop of his lips on the 'P'. The other mom glances back toward me for just an instant, and then again back to the window, half-closing her eyes against the brightness. I wonder about trying to meet these people, about asking this other boy his story, maybe make a new hospital friend for Jonah. But asking those sooo-what-brings-you-here conversation starters can be painful and distressing when they are asked in a children's oncology ward. ("Oh, brain radiation. And you?") Sometimes small talk seems, well, too small in the shadow of the enormous, cancerous elephant in the room. So I decide to keep quiet and return to my typing. Besides, I think to myself, it's early, and we are all so sleepy and ridiculously warm in here anyway. The day before, Jonah and I had driven to Riverfront Park to eat a late lunch following a checkup, and we came unprepared for the weather. The afternoon heat slowly baked into Jonah's black jeans and long-sleeved T-shirt, while the May sunlight threatened to burn his bald head. My dark hair absorbed the heat like a cast iron skillet. We moved to some semi-shade and ate our sandwiches on a dusty, metal-grid picnic table. Nearby, a half-dozen flip-flopped moms with squealing children splashed—some of them fully dressed—in the park fountain. No men among them, and not a wedding ring to be seen reflecting the sparkle of afternoon light. At least two of the moms displayed tattooed cleavage above the squeeze of their strapless sundresses as they bent low to lift their dripping toddlers. Every mom is wearing shades. This, I noted, appears to be the year of the gold-rimmed aviator sunglasses. 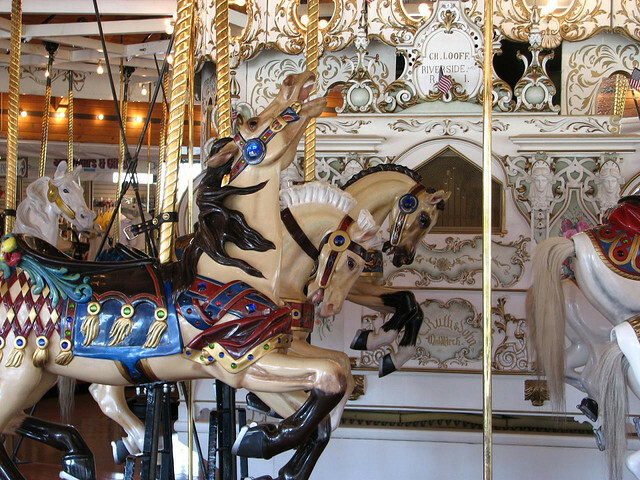 Jonah eyes, fortunately, were transfixed by the colorful rise and fall of merry-go-round horses on their gilded poles. He was listening intently to the carousel music and asked if the tunes were played live on a real organ—an instrument he hopes to learn to someday. Maybe he was considering future summer jobs—organ gigs at carousels and baseball parks. "No, I don't think so. Just a recording. But I bet there used to be an organ in there at one time," I said. "Oh," he said, disappointed. He slowly dragged a limp french fry back and forth through a puddle of ketchup and then set it back down. "Ugh. I am roasting." This is the kind of unseasonable heat that makes politicians climb onto their climate-change soapboxes and panicked consumers trade in their Hummers for pocket-sized electric cars. It is also the kind of weather that sends flabby humans of northern European descent out in herds to overwhelm the city streets and public parks with vast displays of blindingly pale flesh. Human dignity, it seems, cannot compete with the promise of a spring sunburn. Too-tight shorts and too-short tube tops parade unabashedly across the lush lawns while well-fed seagulls hop and flap eagerly after them, hoping a few bits of that muffin-top whiteness will drop in Wonder Bread crumbs to the ground. The cool air of early morning is sweet when we walk to the car the next day, but as we pull onto the interstate to return to the hospital for Jonah's spinal tap, the sun is already poised to dominate the day—not so much as a hint of a cloud to interrupt the faintly blue expanse above us. Watching the drivers in the east-bound lane flipping down their visors and shielding their eyes with their hands against the rising glare, I am glad to be driving west. Jonah tilts his seat back and snoozes on the way. I enjoy his company, but when he sleeps, I savor the silence—or rather, the steady hum and whoosh of the highway—instead. The rare luxury of uninterrupted thought makes me feel all glowingly poetic inside. I have a habit of trying to compose witty similes or apt metaphors while I'm driving in a quiet car. I imagine catchy first lines for short stories that I will never attempt to write. Often, I use the time to pray. This morning, however, I am thinking of styles of sunglasses, and how they seem to forge the way for styles of regular glasses, and how they serve better than carbon-14 for calculating the dates of old photos. (Ah, yes, 1982. The year of the saucer-sized frames with the graduated pink-tinted lenses.) This is deep stuff. The brilliance of my thoughts is interrupted by the sudden dimness of the hospital parking garage. Jonah sits up and looks around. He sighs, and his shoulders slump when he remembers where he is. At last, the nurse steps into the waiting room and says Jonah's name. He sighs audibly again. 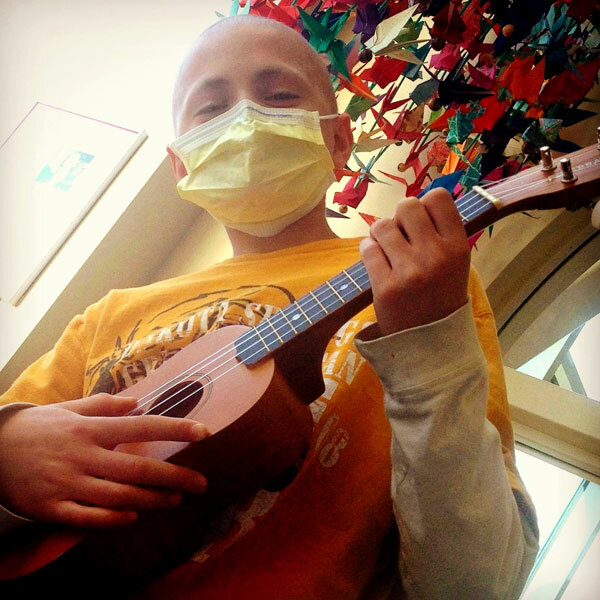 He does have his favorite hospital activities that he looks forward to—especially when the music therapist is there. But on spinal tap days, he dreads the hospital because he knows how he will feel afterward. "You ready, buddy?" the nurse asks in that too-chipper, slightly condescending sing-song tone that he hates. He shakes his head firmly but stands up anyway, shoving his book into his backpack with unnecessary force. "O.K! Let's go!" she says, flashing coffee-stained teeth between freshly glossed lips. She takes brisk steps, but Jonah shuffles, and she has to turn and wait for him to catch up. The IV pole squeaks and rattles along the linoleum tiles, and I hold the IV line up to keep it from getting tangled in the wheels or caught underfoot. In the procedure room, several nurses are waiting, and one of them attaches Jonah to several monitors—heart rate, blood pressure, oxygen levels. Then the anesthesiologist arrives to ask the usual list of questions. He's young and blond and wearing jeans and a massive silver ring and a silver bracelet below his rolled-up shirt sleeves. Very hip. He cracks a few jokes, makes small talk about sports, and manages to get a smile or two out of Jonah while filling syringes with milky-white propofol. "Milk of amnesia" he calls it. At last the doctor arrives, all five-foot-aught of her, with her mass of brown corkscrew curls. Probably the world's cutest oncologist. The oxygen starts, then the proposal, and then Jonah's eyelids flutter closed. He's out. The doctor preps his back with iodine, and moments later Jonah's spinal fluid begins to drip slowly into a clear vial. A nurse walks quickly by us to prepare for the next patient's procedure, and her elbow knocks a vial of propofol onto the floor. It shatters, leaving a spray of glass shards and white liquid on the floor. The nurse gasps with dismay. "Oh, no need to cry over spilled propofol," I say dryly, and the whole room of doctors and nurses erupts into laughter. We're all still smiling as the oncologist injects a syringe full of acid-green methotrexate into Jonah's spinal fluid. And with that, the procedure's done. All that's left is to wait for him to sleep off the anesthesia. For most kids, this takes a matter of minutes. For Jonah, it can take hours for him to come around, and more often than not, he wakes up sick. This time, they wheel him into an infusion room where they let him recover by himself in a more comfortable bed. I turn down the lights and sit with him in the darkness for a few minutes, just to make sure he's resting quietly. Someone down the hall is carrying on a one-sided conversation in hurried Spanish. When I open the door to the hallway, my eyes take a moment to adjust. I return to the playroom to chat with the music therapist who has taught Jonah to play a few simple chords on the ukulele during previous visits. The room is hot and summer-bright. As she asks how Jonah's doing, I see the same mother and son from the waiting walk past the doorway and down the hall. A little girl walks in and immediately sits down to play with a large plastic dollhouse. Her mother has buzzed her own salt-and-pepper hair close to the scalp in order to, I assume, show her solidarity with her balding child. I've seen a few other parents who have done the same. Above her head is a computer printout on the wall depicting the complete pantheon of Disney princesses with egg-bald heads. Snow White on chemo. Sweet, I guess. When Jonah finally wakes up, it's well past noon, and he is woozy and nauseated, but I manage to help him to sit up and drink a sip of orange soda—the only thing that sounds palatable to him—before we head out the clinic doors. He carries a pink emesis bucket with him, just in case. Minutes later, we are back on the highway, driving home through miles and miles of velvety-green hills under a brilliant blue, cloudless sky. I am wearing last year's sunglasses. Soon we will be home. And Jonah is already talking of playing baseball.